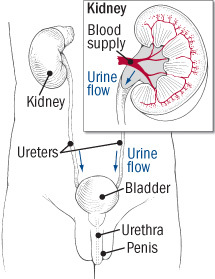 The urethra – the final pathway to move urine from the bladder to outside the body. In asymptomatic bacteriuria, large numbers of bacteria are present in the urine. However, the person has no symptoms of a urinary tract infection (asymptomatic means without symptoms). It is not clear why the bacteria don't cause symptoms. It may be that asymptomatic bacteriuria is caused by weaker (less "virulent") bacteria. The condition does not always need to be treated.